“For my eyes have seen Your salvation which You have prepared before the face of all peoples,” Luke 2:30, NKJV. Scripture tells us that a man named Simeon was a just and devout man among the Jews. He was known to be a man who was approved by God as a righteous man, one who was of a good reputation, well received, or of high standing among the people. God had made a promise to this just and devout man that there would be a time in his life when he would see the Messiah and then would be able to die in peace (v. 26, 29). What joy that must have been for him to hold the Lord Jesus Christ that day! How awesome it must have been to know that the baby he was holding in his arms, was also the One through Whom all things were made and there was nothing made in the world that was made without Him (John 1:2). This was the Child whom an angel had announced to shepherds that in the city of David a Savior, Christ the Lord was born (Luke 2:11). This was the Child whom three wise men traveled a great distance to see, following the star to Bethlehem and when the arrived, they fell down and worshipped Him, presenting gifts of gold, frankincense, and myrrh (Matthew 2:11). Whenever we see a Nativity scene somewhere in a neighborhood, we should live with a conscious recognition that this Child, is the Light of the World where people should not walk in darkness but have the light of life (John 8:12). This was no ordinary child, but God himself who came to dwell among us (John 1:14). There is a couple whom I know that just had a baby girl over the summer and her name is Hope. She is such a beautiful little girl too. My friends and been trying to become pregnant so that their first daughter, Grace, might have either a baby brother or sister to enjoy her life with. When I saw this little baby girl just about a week after she was born, I was ecstatic with joy to see her. I was probably as excited about her birth as her parents were and had such a pleasure to hold in my arms. This tiny little baby that was recently curled up in her mother’s womb who had now brought such a joy to her parents and sister, who will certainly bring as much joy to the lives of many people who would watch her grow up and become part of her life. I am sure that many of you can relate to holding a baby for the very first time, whether it is your own child or someone else’s. Do you remember the joy someone had of holding your son or daughter for the first time? Do you remember how beautiful they looked in their arms, so innocent, so precious? I can only imagine those same feelings and more when Simeon held God’s salvation for the first time. The joy he must have had to know that he would die in peace with God’s promise fulfilled to him. There is so much in the Bible regarding the prophecy of the coming of God’s Messiah and in just a few days, the world will celebrate Christmas, the birth of Jesus Christ. Prophecies of the Messiah are found in nearly three hundred references throughout the Old Testament and each of these were fulfilled by just one person, Jesus Christ, as solid confirmation and credibility as the Messiah. Let’s take a look at just three prophecies and find them in the New Testament. “And suddenly a voice came from heaven, saying, ‘This is My beloved Son, in whom I am well pleased.’” Matthew 3:17. “But you, Bethlehem Ephrathah, though you are little among the thousands of Judah, yet out of you shall come forth to Me the One to be Ruler in Israel, whose goings for the are from of old, from everlasting.” Micah 5:2. 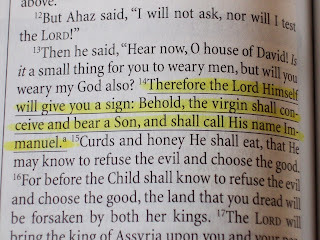 “Therefore the Lord Himself will give you a sign: Behold, the virgin shall conceive and bear a Son, and shall call His name Immanuel.” Isaiah 7:14. “So all this was done that it might be fulfilled which was spoken by the Lord through the prophet, saying, “Behold, the virgin shall be with child, and bear a Son, and they shall call His name Immanuel,” which is translated, “God with us.” Matthew 1:22-23. Three Old Testament prophecies fulfilled in the New Testament, where there are still 297 others that establish a compelling truth, to the life of Jesus Christ. I found this to be an interesting set of figures concerning the overall probability of the odds of the Messianic prophecy occurring without God and these numbers are incredible. Total Probability (without God): 1 in a 100 billion, billion, billion, billion. "in hope of eternal life which God, who cannot lie, promised before time began, but has in due time manifested His word through preaching, which was committed to me according to the commandment of God our Savior;" Titus 1:2-3. So, Jesus Christ fulfilled all the prophecies in the Old Testament as they are revealed in the New Testament. Those yet to be fulfilled relate to His return and the coming judgment of the world. The probability of God not orchestrating the prophecies of Christ, his birth, his life, his death and his resurrection are astronomical compared the fulfillment of the Scriptures. With that, the burden of belief lies upon each person, to choose to believe the compelling and concrete evidence, or to deny it and risk being eternally wrong without a second chance to make an appeal of forgiveness. For if the word spoken through angels proved steadfast, and every transgression and disobedience received a just reward, how shall we escape if we neglect so great a salvation, which at the first began to be spoken by the Lord, and was confirmed to us by those who heard Him, God also bearing witness both with signs and wonders, with various miracles, and gifts of the Holy Spirit, according to His own will? Hebrews 2:2-4. McDowell, J. (1999). Support of Deity: Old Testament Prophecies Fulfilled in Jesus Christ. In The new evidence that demands a verdict (chapter 8). Nashville. Thomas Nelson Publishers.